Two-person desks are a trending item in office furniture. The idea is simple: it’s a desk that’s intended for use by two individuals. Designs vary, from longer desks with users seated side-by-side, t-shapes, l-shapes, and face-to-face models. While some people may prefer individual desks, there are many benefits to two-person desks. For employers, two-person desks can cut down on space and save money. They can enhance productivity, create a more visually appealing office layout, and increase teamwork. Two-person desks might be the solution your office space needs, especially if you have a larger number of employees or a small amount of square footage. Individual desks can be bulky and overbearing. With two-person desks, you can create specific configurations that make the best use of your space. You can place these larger desks against walls, in the middle of the floor plan, or wherever the desk works. With the help of a professional office furniture company, you can make the best use of your square footage, choose L-shaped, T-shaped, and other two-person desks to maximize your space. As an employer or buying committee, you’ll save money by purchasing two-person desks. Costs for one two-person desks may be higher than one individual desk, but total cost for all employees will often be far less in total. 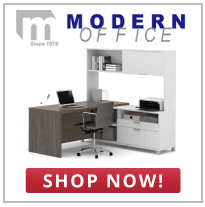 Make the most of your space and money with two-person desks from Modern Office Furniture. Two-person desks can create a cleaner and more appealing look for your business. A well-laid out office plan with two-person desks will appear less crowded than individual desks and will also reduce clutter. With less space on their desk to display personal items, you’ll achieve a more modern appearance. Employees will also have more room to walk around and find their co-workers with a two-person layout. With less room separating each other, employees can develop new bonds and camaraderie. Your new setup with two-person desks may help improve productivity and efficiency in the workplace. Humans are competitive by nature and will increase their workload if they see others working hard. This work setup also encourages teamwork, as coworkers are close by to ask for help or a suggestion if they’re stuck on a problem. Two-person desks are a fantastic solution for offices with tight space or many employees. You can make the best use of your space, save on costs, and create a more appealing and neat looking office. There may be additional ancillary benefits, including enhanced efficiency and collaboration.